20130205 - Up in the am and to the post office and then over to the rental. Ed was there and we carried out the destroyed stove. 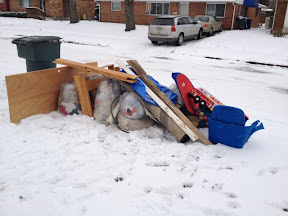 I then set in fixing thing up an taking out the second huge pile of trash. Home and L trying to get D organized....... I headed out to a meeting for dinner and then home to play some Xbox with G while L finished up hair cuts on the boys. J&I play a round of rummy and them all boys to bed. Watched the buckeyes get beat by Michigan. 20130204 - Hard to Eat Rice?